If you’ve been spending October planning the perfect costume, dreaming of treats and trying to come up with new and creative ways to scare your friends to death, you’re not alone. 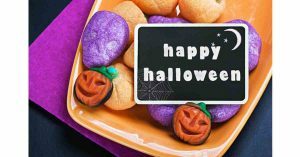 Halloween celebrations have become extremely popular for kids and adults. In fact, Halloween generates about $7.4 billion in spending for our economy, according to the Wall Street Journal. But any ghost or vampire will tell you that it’s fun that makes the holiday. And there’s nothing more fun than a Halloween Party. NY Party Works has everything you need so you won’t get a fright out of party planning. Read below to find out more information about our Halloween Party Rentals. Let’s face it, Halloween serves one very important purpose. And that’s to make sure that you have an excuse to eat as much candy as possible. So you want to be certain that your Halloween party has as much candy as possible. NY Party Works has you covered. Our Candy Wall has all types of chocolates as well as a wide variety of candies and gum. It’s just like trick or treating only it’s a lot bigger than your neighbors’ candy bowls. You can also make candy a more personal experience by having your photo printed on a personalized candy box. It’s a great take home souvenir for your guests. We’ll take a digital photo of them and then we’ll custom print that photo onto a candy or cereal box. Now that we have candy squared away, we’ll move on to another major Halloween tradition, dressing up. Your guests will most likely have their own ideas for the costume party, but we can help with our face painting and body art. Our face painters can transform your guests into their favorite animal, or we can make a whole host of designs. NY Party Works can decorate your guests with hand-painted tattoos, glitter tattoos, crystal tattoos and henna tattoos. It’s a great way to enhance a costume. Let’s move on to spooky. The perfect Halloween party has one foot in our world and one foot in the supernatural. NY Party Works can take your guests into the next dimension by sending a fortune teller to your Halloween party. We’ll let you know if love, fame or fortune is just around the corner for you, or if danger lurks. Either way, it’s all in good fun. We can also provide handwriting analysts. One of the things that makes a Halloween party different from any other type of event is ambiance. Many Halloween parties are at night, and yours will have a memorable glow if you rent one of NY Party Works’ LED game tables. You can get your kicks with LED Foosball, tee off with LED Mini Golf, serve and smash with LED ping pong or push your way towards LED shuffle board. They’re all the classic games you know and love, with a fresh look that’s sure to get glowing reviews from your guests. You don’t want your Halloween party to be a horror show. If you want an event that will send chills down your guests spines, contact NY Party Works today!